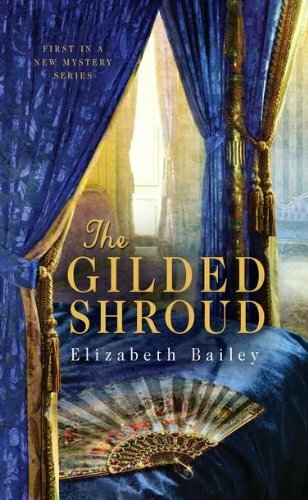 The Gilded Shroud is a romance with a mystery, not to be confused with a mystery that has a romance. Every genre has rules that are followed. These rules may be bent, but mystery readers expect one certainty: The problem must be solved. Perhaps justice is not served, perhaps the bad guy wins, but the problem always has to be explained away. Rules for romances may have changed from heaving bosoms and flowing locks, but this rule—a happy ending—is not to be trifled with. Today, even in historical mysteries, women don’t need men to save them. If the poor relation falls in love with the lord of the manor, he returns the affection unreservedly, and laws of society be dammed. It’s a plot that’s worked from Jane Eyre to Pretty Woman. In this version, set in Georgian England, the widow Otilla Draycott is the new companion to crusty Dowager Lady Polbrook. On her first day, the Dowager’s daughter-in-law Emily is found dead—strangled in her sumptuous bedroom. Emily and her husband Randal live with his brother Lord Francis Fanshawe and haven’t gotten along in a long time, each famous for extramarital affairs. Naturally, Randal is a prime suspect, and the morning the body is discovered he flees the premises, making the situation look very bad for him. Otilla gets involved because none of Randal’s family wants to believe he could have killed his wife. Indeed there are several odd things about the scene: A bejeweled fan is found in the bed chamber, then later it’s missing; still later Emily’s jewels also go missing. Why would her husband take them? Surely he has access to more money than these baubles would bring him? Perhaps a better suspect is one of Emily’s lovers who has acted rashly in a fit of jealous rage? The servants make up a varied lot, from housemaids scared of their own shadows to manservants that know too much. Mrs. Thriplow, the formidable chatelaine, wants to get the household back in order, and her staff can’t do their jobs unless the murderer is caught. The house is a character in its own right, with secret passages that may shed light on how an outsider could gain entrance. Otilla has her work cut out for her. Because she is clever and intuitive, Lord Francis is impressed with her well-considered deductions. He understands this outsider can be relied upon to solve this messy business without dragging his brother’s name through the mud. The Gilded Shroud is too long, and a more hands-on editor might well have been able to cut 100 pages out of the narrative, resulting in a faster-paced narrative more in keeping more with current tastes. On the other hand, combining the two genres of romance with mystery is a more difficult than it looks. True, the ending turns out to be somewhat expected. But it’s a lot of fun accompanying Otilla there.